Double Hollow extruded aluminum door with “huck” riveted galvanized door angles provides a wide, easy loading opening. Doors are pre-punched so they can be reversed. Door can be turned over and a new bracket bolted on to give longer door life. Made so galvanized hinge pins can be put in top or bottom of door when reversed. All door hardware is either galvanized or stainless steel for extended life. We use only “6036-T6” aircraft grade aluminum in our extruded doors. Choice of Bright’s highly recommended #1 Green hand rolled fiberglass with woven matting and reinforced edges, or white machine extruded acrylic fiberglass. Top of partitions are welded to floor joist for added structural strength; Vertical partitions are standard at top and bottom on cage ends. Horizontal partition is still available on request. 3″ x 8″ x 11 ga. with 3″ x 3″ formed inserts welded into fork tubes for added strength. All cage Securement devices are tested and rated at 3,000 lb Working Load Limit. NEW One Piece bumper plates are standard at bottom to protect chickens and cages from fork damage. Old style bumper plates are still available upon request. 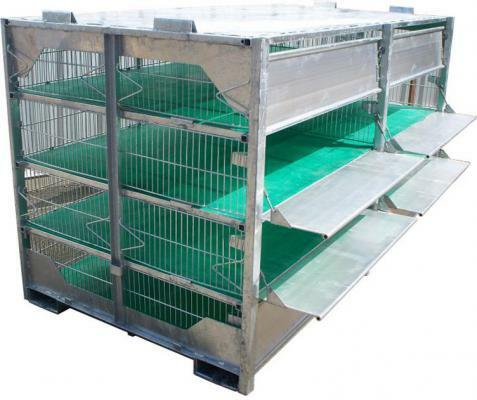 Hot dip galvanized in Prime Western Zinc; 5 year guarantee against rust-out and Bright Coop’s Famous Fit and Finish protects your cage and its cargo for years to come. Slotted bases – cut outs aid in cleaning of fork tubes. Two 2″ x 18″ cut out per fork tube. Bright’s #1 green woven fiberglass with reinforced edges and metal wear tabs on ends.